ImmiFlex contains Wellmune, the only beta glucan that's clinically proven to support innate immune health, and is backed by $300m worth of research, 40 patents & patents pending, numerous clinical trials, is EFSA approved and has Novel Food status. ImmiFlex has accreditation from Informed-Sport, and is shown to be contaminant-free and suitable for athletes and sportspeople undergoing drug testing. 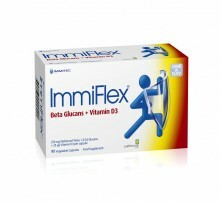 ImmiFlex also contains 25mcg of vitamin D3. An important factor in the production process of Wellmune WGP, the active ingredient in ImmiFlex®, is that the protein elements of the cell (which may trigger yeast sensitivity in some people) are removed. This leaves just the active beta glucan. 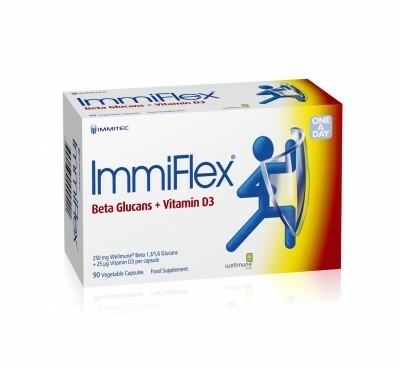 This is one of the factors that sets ImmiFlex® apart from most other beta glucan products. So there are no grounds for concern if you are worried about candida. Numerous studies have defined Wellmune WGP’s activity at the cellular level. Further research studies have compared Wellmune WGP to a placebo in subjects experiencing high levels of physical or lifestyle stress and demonstrated reduced cold and flu symptoms, as well as reduced fatigue, tension and increased mental clarity. Generally it is safe to take ImmiFlex® with other medications and supplements. If you have any concerns however, it is best to seek medical advice. When Not to Take ImmiFlex®? Most people will derive benefit from ImmiFlex® but there are some exceptions. ImmiFlex® is not suitable for anyone who has undergone an organ transplant. The same will apply to anyone who is being treated to suppress their immune system. 1,3/1,6 beta glucan are non-toxic and non-allergenic. Due to the patented refinement process they are suitable for daily use even by those with a previous history of yeast intolerance. Research in scientific journals demonstrates an excellent safety profile with no significant adverse effects reported. ImmiFlex® is suitable for children. The only problem may be getting them to swallow the capsules. There is no harm in breaking the capsule and sprinkling the powder on food if the capsule proves difficult to swallow. The advice for pregnant or lactating mothers is to speak to your healthcare provider. ImmiFlex Kids is designed to support the efficient functioning of the innate immune system. ImmiFlex Kids contains Wellmune WGP a patented beta 1,3/1,6 gluco polysaccharide extract of the Baker’s yeast (Saccharomyses cerevisiae) cell walls. Wellmune WGP is protected by more than 40 patents and has shown promising immune support properties in research trials. Vitamin D helps (amongst many other important functions) to maintain a normal immune function. Ingredients: Beta 1,3/1,6 Gluco Polysaccharides, Hydroxypropyl Methyl Cellulose (capsule shell), Inulin, Tri-calcium Phosphate, Vitamin D3 prep (Sucrose, Gelatin Hydrolyzed, Corn Starch, vit-D3, dl-alpha Tocopherol). Directions: Children – take 1 capsule daily with water. Do not exceed the recommended intake (unless recommended by your doctor). Food supplements should not be used as a substitute for a varied and balanced diet and healthy lifestyle. If you are pregnant or lactating consult your healthcare provider before taking this product. Click the button below to add the ImmiFlex 90 Vegi Caps to your wish list.